My choice for today's Forgotten Book is a 1934 title from the pen of Anthony Berkeley. Panic Party, aka Mr Pidgeon's Island, was the last novel to feature Roger Sheringham - one of the great Golden Age amateur sleuths, even though his career lasted less than ten years. In fact, the novel does not break all the Club’s rules by a long stretch. Sheringham joins a yachting party organised by Guy Pidgeon, an Oxford don who has come into the money. The group finds itself marooned on a desert island, and Pidgeon announces that their party includes a murderer. His 'murder game' has a predictable outcome – soon he is found dead. When I first read this book years ago, I felt rather dissatisfied with it. On a second reading, I was more sympathetic. It's an interesting experiment. almost a forerunner of Lord of the Flies. And, as usual with this author, there are some witty passages as well as several darker ones. I'm interested in the ways in which crime novelists are influenced in their work by real-life cases. Examples of those influences go back to the days of Edgar Allan Poe and Wilkie Collins, and a number of writers of the modern generation draw on actual crimes, as did a host of detective novelists in the Golden Age. Agatha Christie, however, is generally not thought of as a novelist who was greatly influenced by true crime. However, a book published last year by the History Press, and written by Mike Holgate, seeks to prove otherwise. Agatha Christie's True Crime Inspirations is relatively short but lively book which ranges widely, sometimes more widely than the title would suggest. The classic example of a novel where Christie did draw on a real-life crime is Murder on the Orient Express, which was plainly inspired by the kidnapping of the baby of the American aviator Charles Lindbergh – although, of course, Christie used a great deal of imagination to embellish the basic material and produce one of the most famous whodunnits of all time. Christie was certainly interested in true crime, making references to the Dr Crippen and Constance Kent cases, amongst others, in her novels. But there are not many books which draw heavily upon her interpretation of real-life cases – for instance, I think it is a bit of a stretch to suggest that exploits of Jack the Ripper was an inspiration for The ABC Murders. So Mike Holgate compensates by including various accounts of crimes, scandals and tragedies which affected the lives of some of the famous personalities involved in Christie's long career. As a result, the book is not quite what I expected – but I found it an entertaining read. The Woman in Question is a relatively unsung film, made in 1950 by Anthony Asquith, the son of a former Prime Minister. I found a DVD version in my quest for whodunit movies – as I've mentioned before in this blog, they are much scarcer than thrillers. And I certainly wasn't disappointed with this one. A woman (played by Jean Kent) who scrapes a living as a fortune teller in a small seaside town is found strangled in her home. A police team headed by Duncan MacRae investigates and interviews a series of witnesses and potential suspects. The unusual and clever feature of the film is that each witness portrays the victim in a different light, so that understanding her character from the contrasting accounts becomes key to solving the crime. What other books and films have done this so explicitly? A few, but not a large number, I think. Among the witnesses is a young stage performer played by Dirk Bogarde, whose American accent is so ropey that it comes as a great relief when he admits to his girlfriend that he was actually born in Liverpool – not that there is any trace of a Scouse accent, either. But overall he and the rest of the cast do a good job. When it emerged that the dead woman had a pet parrot, I anticipated that the bird would provide the detectives with a vital clue, and so it proved. I managed to figure out the identity of the murderer, but this did not in any way spoil my enjoyment of a short, snappy and entertaining mystery movie. It is almost a British film noir, and I can definitely recommend it. I haven’t seen the 1987 original of which the 2009 film The Stepfather is a re-make, but the new version offers both the positive and negative aspects of psychological thrillers and it’s as interesting to discuss those issues as to talk about the film itself. But as to the film, Dylan Walsh plays Grady Edwards, who as the opening credits roll calmly disguises himself as he walks away from a home which has became a crime scene – he has murdered his family. A weakness of the film is that we never know why. The man is deliberately elusive, but the script should (in my opinion) have offered more insight into his make-up. Calling himself David Harris, he quickly befriends an attractive divorced woman who decides he is perfect and invites him into her life and her family. Only her older son has suspicions – on which the son’s girlfriend, played by the frequently bikini-clad Amber Heard, unwisely pours scorn. The stepfather takes great pains to hide his identity and not be photographed, yet stupidly gives himself away by forgetting his story about his false past. In essence, this is a formulaic movie, but quite well done. Was it a mistake to make it clear from the outset that Harris is a baddie? I think so. Was it unwise not to portray the characters in more depth? Undoubtedly. Yet I kept watching – the action is well-paced and not unduly prolonged. The final scene suggests a sequel is in the offing. Will I watch it? Perhaps. 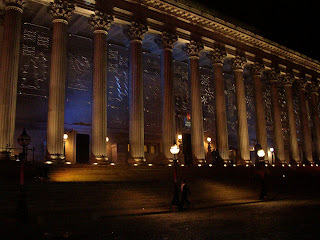 Crime festivals like Harrogate succeed or fail to a large extent through the quality of their panels and main events. But of course, quality is not entirely dependent on the fame of the panellists (and thank goodness for that!) Much depends on how the different people involved gell together. I did feel that our 'legal eagles' panel was one where the different personalities clicked together. A good moderator like Peter McCormick helps. Another example was a panel called 'What Lies Beneath', on psychological crime fiction. The moderator was N.J. Cooper, a fine writer who is also supremely accomplished at putting people at their ease and creating a feelgood factor. A different situation occurred when the moderator of a conversation between the American thriller writers Linwood Barclay and Lisa Gardner clearly found the task of public speaking a bit of a challenge. A tricky situation that anyone can sympathise with - it took me years to feel comfortable with speaking in public, so my heart went out to the person involved - and one that was happily redeemed by the evident good chemistry between the two authors. I've never read a Linwood Barclay book, but his wit and genial manner made me interested in his work. Which leads me to another point. You can like a person and not necessarily like their books. But it's true, I think, that if one comes across a previously unfamiliar author at a convention and finds them personally appealing, one is more tempted to read their books. It may not be logical, but I think it happens a lot. I got back home this afternoon after a truly exhilarating time at the Theakston's Old Peculier Crime Writing Festival at Harrogate. It was great to catch up with old friends and also to meet some nice people for the very first time. This was the very first time I've been asked to be on a panel at Harrogate. The title was 'Legal Eagles' and it proved to be a real treat. This was due in no small measure to the fact that it was very well moderated by an eminent Yorkshire lawyer, Peter McCormick. I've known of him for many years, but we'd never met before. My fellow panel members were a delightfully diverse group. The brilliant Frances Fyfield is someone I've been lucky enough to know for a long time, but M.R. Hall is a barrister turned novelist I've met more recently, having twice shared a platform with him at Crimefest. Helen Black, a solicitor whose work has been compared to Martina Cole's, is a friend of a friend whom I'd only met very fleetingly in the past. It was a really enjoyable session, and the hour flew by. The feedback from audience members was great, and I felt thrilled to be speaking at the hotel most famous as the place where Agatha Christie hid during her disappearance in 1926. Quite a place, quite a weekend. I'm glad my post about reviews on Wednesday attracted quite a lot of interest. As a reviewer, as well as a writer, I'm all too well aware of the sensitivities of the subject - and its importance to those concerned. I thought I'd tell you the story of my first bad review, back in 1991. Of course, I was excited by the appearance of my first book, All the Lonely People. It featured a Liverpool lawyer, Harry Devlin, and was the first in a series of (so far!) eight books. The early reviews were great. Then I read one in a magazine for law students. It began well, by immediately comparing my book to Raymond Chandler. I was pleased, though surprised, as it really bore no resemblance to the work of the great private eye writer. Then, as I read on, it emerged that the reviewer really didn't like Raymond Chandler. Nor did she like poor old Harry. And she didn't like my book, either. Indeed, she went on to make it clear she didn't have any time for crime fiction in any shape or form. I remain unclear as to why she bothered to write the review, but I do know the magazine soon became defunct and of course I really didn't mourn it! Anyway, my book was later shortlisted for the award for best crime debut of the year. So perhaps, whatever its faults, it wasn't too terrible after all. But the incident has stayed with me as an encouraging example of why one shouldn't get too despondent about reviews, however unkind or indeed unfair. And there is one golden rule, I think, for authors. It's a mistake to argue with reviewers who don't like your book. You have to chalk it up to experience. Not a happy experience, sure, and like any other writer, I love having my books positively reviewed. But there are much worse things in life than bad reviews. Besides, just occasionally, a bad review says more about the reviewer than about the book. I’m often asked about literary agents – usually by unpublished writers seeking recommendations, but sometimes by very experienced writers whose relationship with their own agent has run into trouble. So here are a few very subjective thoughts based on my own experience. For a new writer, I think it’s highly desirable to have a decent agent batting on your side. Without this support, it really is an uphill struggle. Not an impossible struggle, but very, very difficult. Publishers take agented submissions much more seriously. It doesn’t matter whether they are right or wrong to do so; it is the reality, with few exceptions. For any writer, losing the editor who took you on to their list can be traumatic. It has happened to me more than once. But losing or falling out with your agent is even worse, and I know a number of authors who have found this a very traumatic experience. If at all possible, it is a good plan to find someone whom you can trust and who is on your wavelength – and stick with them. I’ve been lucky with my own agent, Mandy Little. She took me on when I’d never published any fiction, at the end of the 1980s, and we’ve been together ever since. I have always had the feeling that she believes in me as a writer, and though I haven’t made her rich with commission – far from it – she continues to have faith that one day there will be a breakthrough. You never know! '"We have sometimes discussed the future of the Detective Novel. We know only too well ourselves-imposed difficulties; our oaths to play fair, to conceal from the reader no clue of which are detective is aware, to eschew Death Rays and Unknown Poisons and over-use of Chinamen. We know, too, our other difficulty – the character of our Detective. You, I believe, discern a new road – the "inner history" of the murder itself. You and Miss Sayers and others have given us masterly glimpses of that new road. But – will it not lead you away from Detection? Today I set off for the Theakston's Old Peculier Crime Writing Festival at Harrogate. For the first time I've been invited to be on a panel, 'Legal Eagles', on Saturday. My fellow panellists include the marvellous Frances Fyfield. I've been involved with Harrogate in various ways over the years. Hosting a table at a murder mystery dinner, for instance, and giving a talk at the Creative Thursday workshop to would-be writers. It's always a very well organised weekend and for that Sharon Canavar, Erica James and their team take great credit. One highlight was when The Coffin Trail was shortlisted for the best crime novel award, and I was up against Ian Rankin, Val McDermid (who won), Stephen Booth, and Susan Hill. It was certainly one of the highlights of my career, even though I do think I've written quite a few better books both before and since The Coffin Trail! 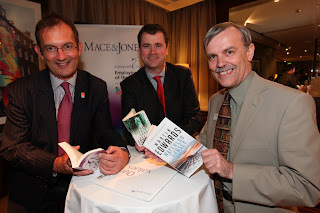 And another good occasion was the launch four years ago of the CWA anthology I.D. at an event at the Pump Rooms. Note the pints of Theakstons strategically displayed on the book table! The imminent publication of The Hanging Wood means that, like any author, my mind is turning to the possibility of review coverage. I say 'possibility' because the days when review coverage was a given have gone - at least so far as newspaper reviews are concerned. My early books regularly received attention from national newspapers such as 'The Times' and 'The Guardian', but the reviewers of the 90s have largely left the stage. An example is the late Matthew Coady, a delightful man who combined political reporting with crime reviewing and who was very good to me and my early Harry Devlin books. Fortunately, the world has moved on, and now the blogosphere provides a good many writers, including (so far!) me, with extensive review coverage. Amazon reviews, too, become more important with every year that passes. And with this book, I'm in the curious position of having had it published first in the US, so that I've had the pleasure of getting some very positive reaction from both the press and bloggers already. Do reviews matter? After all, I've done well in terms of reviews for a long time, and never really made a massive breakthrough - though I have kept going happily! But yes, I do think reviews matter, and for a range of reasons. Good reviews are obviously great for morale. Bad reviews need to be considered with care - I pay more attention to criticism from someone who would normally be a fan of my work than from someone who doesn't really get what I'm trying to do, and many other writers have a similar attitude. I do think, though, that you have to be a bit fatalistic with reviews. You can't control what people think, or say. All you can do is your best, and try to fulfil your personal contract with your readers. I’ve mentioned Andrew Taylor and his books several times in this blog. I was reading his crime novels long before I met him – he started his career young, and began with a series featuring the amoral William Dougal that is often described as ‘quirky’. It’s almost a cliché, but it’s still a fair description, because the Dougal books are definitely unusual and different. One of my favourites is The Sleeping Policeman. As a full-time writer, Andrew has turned his hand to many kinds of projects. He even produced five novels based on the Bergerac TV series, under a pen-name, Andrew Saville. Every now and then he has turned out a stand-alone psychological suspense novel, and my favourite of these is The Barred Window – really good. His next series was set in the 50s in the fictional Border town of Lydmouth. It features the relationship between a married cop and a female journalist – one book, cleverly, focuses on the story of the cop’s wife. This series began quietly, but the later books are exceptional. I’ve written an article about Thornhill, the cop, which Andrew included on his website, and I mean to update it some day. The Roth Trilogy is, arguably, his masterpiece. I’ve written about it before on this blog. Suffice to say that it’s one of the most impressive trilogies I’ve come across in crime fiction – a study, going back through time, of the making of a sociopathic killer. Then there are his historical novels. The American Boy is the best-known, and I reviewed The Anatomy of Ghosts recently. It's shortlisted for the Harrogate Festival award this week and I'm keeping my fingers crossed for him. I’d particularly mention Bleeding Heart Square, which is superbly done. He always conveys the atmosphere of the period, and the setting, splendidly, and Bleeding Heart Square has a very good plot and also some resonances with present day Britain. A very good writer, whose work is varied and highly literate. If you don’t know his work, do give it a try. Book launches are great fun for an author, but are they really worth doing? I've heard varying opinions on the issue - just as views differ as to the value of book signings. I've been to plenty of launches by other authors, as well as having a few of my own, and I've enjoyed them. Maybe the key question, though, is: what do you expect to get out of them? For writers like me who do not sell in vast quantities, realistically, part of the rationale for a book launch is simply to have a good time in the company of like-minded people. Selling books is a bonus, not the main purpose. For bestsellers, of course, it's different, mainly a commercial enterprise. But a launch which focuses just on selling isn't terribly attractive in my opinion. An unexpected benefit of my last launch, of The Serpent Pool, at Gladstone's Library, was that the setting gave me an idea for part of my next book. So it's very fitting that The Hanging Wood will again be launched at Gladstone's Library, on 28 July. I'm really looking forward to it. Having a distinctive venue for a launch seems to me to be part of the fun of it all. I've been lucky in this respect. 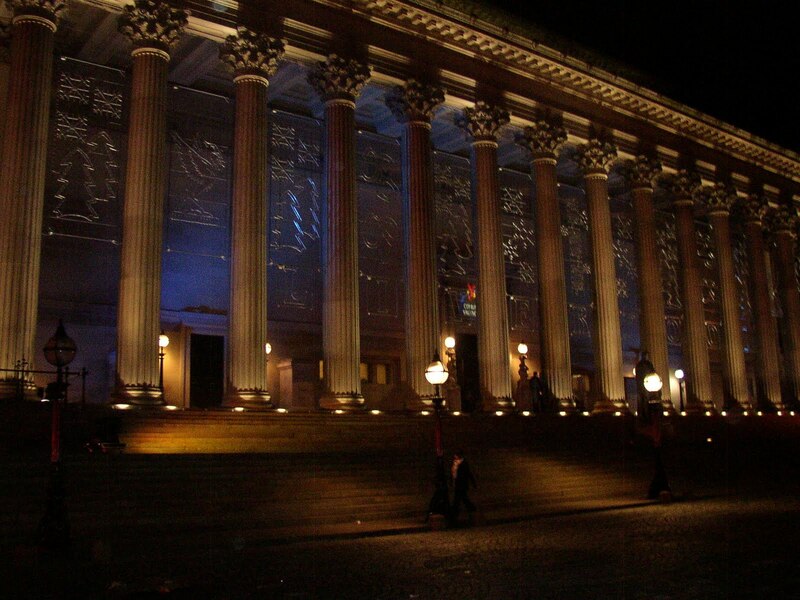 In the past, my launches have taken place at such terrific locations as Manchester Central Library (M.O., the CWA anthology), The Hard Day's Night in Liverpool (Waterloo Sunset) and St George's Hall in the city (Dancing for the Hangman.) Nights to remember and I'm optimistic that 28 July will be equally memorable. The Hanging Wood is due to be published in the UK later this month, and I'm planning to go back to a daily blog post for the next fortnight, as if to celebrate! I'm also looking forward to my first panel at the Harrogate Festival - where I hope to see some of you - and the book launch at Gladstone's Library. Meanwhile, I just watched the final two episodes of the (in my opinion) enjoyable Case Histories starring the excellent Jason Isaacs as Jackson Brodie. The changes to Kate Atkinson's book, When will there be good news? were many, but I thought it still worked pretty well. The story seems clearly to have derived in part from the terrible case of Lin, Megan and Josie Russell, though I've seen some reports where Atkinson says she got the idea from another attack on a woman in a park. Whatever, she makes brilliant use of the concept of a girl who is a true survivor, and this came through in the TV version. It did make me wonder, though. What other crime novels of the past 20 years have been based on or influenced by real life crimes? Labels: Case Histories review, Gladstone's Library, Jackson Brodie, Jason Isaacs, Josie Russell, Kate Atkinson, The Hanging Wood, true crime, When Will There Be Good News? Anne Meredith is not a name to conjure with in the history of crime fiction, yet this pseudonym does not deserve to have sunk into oblivion. It is one of a number of pen names used by Lucy Malleson, who is far better known as the prolific detective novelist, and creator of Arthur Crook, Anthony Gilbert. My choice for today's Forgotten Book is the first novel she produced under the Meredith pseudonym, back in 1934. Portrait of a Murderer is, considering its date, arguably a pioneering work. There are some hints of the irony deployed by Francis Iles, but the novel has a bleakness of tone which is distinctive. The opening section, comprising just one paragraph, is memorable – so much so that I will quote it in full. "Adrian Gray was born in May 1862 and met his death through violence, at the hands of one of his own children, at Christmas, 1931. The crime was instantaneous and unpremeditated, and the murderer was left staring from the weapon on the table to the dead man in the shadow of the tapestry curtains, not apprehensive, not yet afraid, but incredulous and dumb." Even though the identity of the culprit is revealed fairly early on, the story that Meredith tells held my interest throughout; at times, her approach almost put me in mind of Ruth Rendell. I don't want to say too much about the plot, as to do so would probably spoil it to some extent. But although I missed the wit that Iles often deployed, I can recommend it. Certainly, I'm very surprised that it has been ignored by historians of the genre. I rather like the well-publicised recent story of the librarian who celebrated her 60th birthday with a list of 'things to do' that were not too dramatic, but potentially very pleasurable. You won't catch me abseiling or skydiving, but indolent as I am, rather more modest targets appeal to me. And last week, to celebrate my birthday, I achieved one long-held ambition, to go to the summit of Snowdon, the tallest peak in England and Wales and at the heart of one of my favourite areas. No, I didn't go scaling up any cliff-face. The train journey - which, through a delay, turned into a three hour round trip - was good enough for me. Mind you, scrambling up to the top from the train terminus was quite an experience, given the gale that was blowing. Luckily, I didn't fall off, and before long the mist cleared and the sun shone through. Several crime novels have been set on mountains - Glyn Carr wrote a number, though I haven't read any of his work. I don't know anything about climbing, but I must admit I was tempted by the idea of a short story set on Snowdon, and mused on a possible plot during the journey back to Llanberis. Getting out and about to inspiring places is good for a writer, I think, and I only wish I had more time to do more of it. But perhaps one of these days, this will be possible. In the meantime, though, the short story has to be put on hold. At present the priority is to work out the story-line for the next Lake District Mystery! I had a good time on Saturday, signing books for customers at Hale Bookshop, near Altrincham. The shop, run by Lynne Pollitt, is a good example of a first rate indie bookstore, the type that really needs to be supported in the current climate. Use them or lose them, is the reality. Lynn and her assistant Sam made us very welcome, and even produced coffee in an Anthony Berkeley 'Not to be Taken' mug identical to my own! I was impressed by the vibrancy of the Hale community, even in these times, which are so difficult for retailers. We talked about the possibility of a Hale Festival, and I do think that a well organised cultural festival is a very good way of binding a community together. Of course, it tends to work best in a community that's already strong, but it can work anywhere, if motivated and efficient people run it, and are willing to put in the time, almost inevitably for love rather than money. An example is the Lymm Festival. On Friday night we went to a celebration in lovely surroundings of the tenth festival in our village. It's been extremely successful, and is now being looked on as a model for other places seeking to set up something similar. I've been lucky enough to be involved in various ways, judging writing competitions and giving talks, and it's great fun. One thing we do lack in Lymm, though, is a bookshop. So Hale has a head start, and an excellent literary hub to build cultural events around. You know, you just know, when you pick up a book with the title Crossword Mystery that you are in classic Golden Age territory. Yet this 1934 novel by E.R.Punshon, my choice for today's Forgotten Book, has a bit more to offer than the puzzle. Strangely enough, the flaws of the book concern the puzzle element more than, say, the drawing of characters. The setup is unlikely, with the young policeman Bobby Owen sent to an East Anglian resort after the drowning of a prominent local resident, at the behest of the dead man's brother, who claims that it is a case of murder, but can produce no evidence. Yet Bobby joins his household, masquerading as relative. Suffice to say that it would not happen today. The eponymous crossword is not easy to solve, but the general direction in which the clues pointing is obvious. Similarly, the culprit (because, of course, it does turn out to be a murder case) is easy to spot. Yet the book does have unexpected merits. There is a funny scene when a developer explains his plans to turn the resort into a British Monte Carlo. And there is a sobering account of life in Nazi Germany which, in 1934, must have been relatively ground-breaking. Most notably of all, the final scene is quite horrific. A mixed bag, then. Punshon clearly had considerable ability as a crime writer, and he enjoyed success in his day, publishing more than 50 novels. Yet now he is forgotten. I suspect this is because, on the evidence of the books of his that I have read, he often struggled to blend excellent ingredients into a satisfactorily crafted whole. But this book, despite its failings, was one I was glad to read. I'm a fan of Harlan Coben, especially of Tell No One, and I reckoned audio books would be a good way to enjoy more of his work. as he is strong on both snappy dialogue and plot. I still think it's a good plan, but unfortunately I picked Play Dead, which he wrote when he was learning his craft. Coben warns the reader, very honestly, in a foreword, that this is a tyro effort, but I rather assumed this was simple modesty on his part. In fact, there are good things in Play Dead - an intriguing set-up, and plenty of plot twists, for sure. A couple of newlyweds who seem to have it all have their lives turned upside down when the husband mysteriously disappears and is presumed drowned. But is he really dead? It seems not - so what is going on? For someone interested in the craft of writing, it's also quite intriguing to see an apprentice effort before a talented novelist got into his stride. Regrettably, the downsides outweighed the upsides as far as I was concerned. Having gone to the trouble of undergoing plastic surgery, the missing man behaves so as to make it certain his secret will be found out. I waited patiently for an explanation, but none was forthcoming. And all the characters are either impossibly good-looking, impossibly talented or impossibly bad. If the story had been condensed into a couple of hours, it might have worked, but six hours was very heavy going.I didn't give up on it, but I did groan several times. None of this affects my admiration for Coben at his best. But I'm not sure why he allowed this book to see the light of day. Trust me, my own first novel will remain unpublished, and a good thing too! Last week I mentioned my trip to the Isle of Man. Here are one or two photos from that splendid place, taken on my tour with Chris and Jo Ewan. The Chasms, splits in the cliff rocks, fascinated me, as did the seals basking on the Calf of Man. 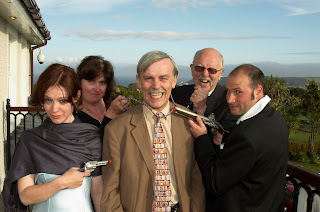 And I've also included the publicity shot from the Victorian mystery event. The actors, by the way, were excellent, despite their murderous intent. Very enjoyable performances. After one visit to the Isle of Man, I was inspired to write a short story set in Peel called 'Sunset City', and trips like this do tend to give a writer fresh inspiration. As well as a lot of good times. Paul Beech has kindly mentioned the talk I gave last Monday at the Lymm Festival. This was very different from the night in Douglas 48 hours earlier, but equally good fun from my perspective. The Festival has proved a great success for the past ten years, and I'm delighted to have been part of it this time around. Labels: Chris Ewan, Lymm Festival, The life of a writer, Who Killed George Hargrave? Scott and Bailey has just finished what I suspect will be the first of a number of series. I'm glad I stuck with it, because it does offer something fresh in TV cop shows. It's not just that the three lead characters are all women cops - though the female slant to the story-line is key to its success. But the flavour of soap opera is never far away. And what that means is that although some things in the series are a bit irksome, at times it all makes for quite compelling viewing. The demands of the story meant that Rachel, the brilliant but wayward young DC, behaved quite stupidly at times, while her older and wiser colleague wavered between staying with her nice but boring husband and going off with a more exciting yet rather dodgy colleague. While their boss,Jill Murray, was a bit manic at times. Yet the quality of the acting by Suranne Jones, Lesley Sharp and Amelia Bullimore was very good, even better than the quality of the writing, which was certainly very capable. The plots weren't bad, either, and the odd implausibility was, I thought, definitely forgivable. After all, there are many classic crime stories with implausible elemeents. Overall, I really enjoyed the show and look forward to more in the future. My choice for today's Forgotten Book is another novel by the unjustly neglected Millward Kennedy – this one is Poison in the Parish, which was first published in 1935. It opens with a rather aggressive dedication to an un-named person who has complained that Kennedy peoples his work with unpleasant characters. Here, Kennedy says, is something rather different. The suspects are all relatively agreeable people. The book then begins with an extract from a letter which is tantalisingly described as a "prologue or epilogue" before the story proper gets underway. Following gossip in a small village, the police have exhumed the body of a rather nasty old lady who turns out to have been poisoned with arsenic. In order to get a handle on life and relationships within the village, the police – rather improbably, it must be said – call upon a wealthy invalid to assist their enquiries. The invalid is called Francis Anthony, and I am as sure as I can be that Kennedy chose the name deliberately as a tribute to his friend and colleague by taking the first names of his two most famous pseudonyms, Anthony Berkeley and Francis Iles. The book is in many ways a homage to Iles, especially in its ironic flavour, and one of its main features is a very unusual murder motive which later found its way (in the context of a very different storyline) into Anthony Berkeley novel. I figured out what was going on in the story at an early stage, partly because aspects of the narrative reminded me of a book that Agatha Christie wrote early in her career. But this did not spoil my enjoyment of the mystery, which is pleasingly put together. I'd say this is one of Kennedy's most entertaining novels, and a reminder of his talent. It's strange to think that he produced only a handful of novels after this one. Perhaps his disastrous experience with the law courts over a libel claim, which I discussed in this blog recently, provides the explanation.